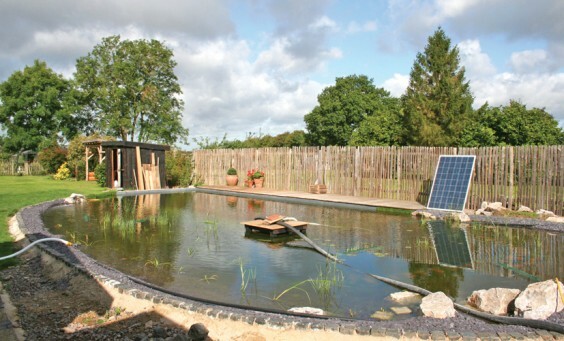 Hannah Genders describes the process of building a natural swimming pool. When we moved to our current house in The Lenches, we inherited an indoor chemical swimming pool heated by oil! The oil heating we never intended to use, so we turned that off and installed a solar mat system to heat the water in the summer. Although it was OK, it still meant using chlorine and lots of chemicals to keep the water from going green and essentially we were swimming in a shed – also the position of the pool building meant it blocked a lot of the natural light coming down the garden. Having seen a number of projects – including some at Chelsea – where the pool was natural, using plants to filter the water instead of chemicals, we decided to have a go at converting ours from an indoor chemical pool to an outdoor natural swimming pool. It has, with hindsight been a much bigger project than we had ever imagined but it is now very near completion and is really starting to look good. The start of the project was to take down the old swimming pool building, which was a large wooden building measuring around 5 x 15m – we managed this with help from some good friends who were very brave, especially on the roof. One of the things I am most proud of about this project is how much we have managed to recycle; the roof and windows of this building were sold, as were the heating systems and all the wood is being reused to build various sheds. Once the building was removed, we needed to dig out the regeneration zone. This is the planted area that filters the water, with the aquatic plants doing the work by taking out the nitrates and phosphates (which cause the unwanted algae) from the water as they grow. Chemicals and sand filters would do this job in a chemical pool. The regeneration zone needs to be one-and-a-half times the swimming zone area and there needs to be a constant movement of water (at a slow rate) from the swimming area to the planted regeneration area. I designed the regeneration area with curves so we lost the very formal oblong shape of the original pool. The swimming zone is deep, eight foot at the deep end, and this will help to keep the water clear. The water is pumped from the bottom of this deep area into the planting. The planted area is shallow, only around one to two feet deep in most areas, which allows the plants to grow and thrive – and as the water warms up in the summer, the constant flow allows the swimming area to warm up too. A usual temperature for a natural swimming pool is 22-25 degrees in the summer months. Once the pool was dug out and lined, we painted the swimming pool area grey to match the slate used on the top of the planted area, so it all tied in. We fitted an underwater deck at the one end of the swimming area, to make sure it had a shallow part in the main pool for children and for safer access. The deck material was also sustainable, made from recycled silage bags. Then we had the challenge of filling it! Tap water in the UK contains a lot of nitrates so this was not ideal, but our neighbours came to the rescue by allowing us to pump water from their well into the pool, until it was full. This was extremely kind of them as it took several weeks of us running next door twice a day to empty the well (about 20 minutes with a large pump), and then waiting for the well to fill before we did it again. It resulted in high quality water for the pool right from the start. The plants are grown hydroponically, that is without the use of soil – they are grown in a washed gravel and this helps with keeping the water clean and means the plants are taking the nutrients they need from the water, not from any soil around their roots. We are now nearing the end of the project – there is some decking to finish, some extra pumps to install (all run on solar energy) and the lawn edging to re-seed, but generally I am thrilled with the result. One of the main things I have noticed since the pool was filled is the light quality. We have gone from a large, ugly building that blocked out the light, especially the late afternoon and evening light, to having the stunning reflective quality that a large body of water gives you as it reflects the sky. The other main feature is the wildlife, with the regeneration zone full of newts, dragonflies and beetles. These don’t tend to come in the deeper swimming area, as they prefer the warm shallow water and need the cover of the plants to thrive. So the swimming area is kept clean, weed-free and wonderful to swim in. I am totally smitten with natural swimming – the softness of the water on your skin, dragonflies buzzing around. . . and next year the plants in the regeneration zone should flower to give even more colour and interest.